A blog about Web marketing, social media, programming, technology, photography & brain food! 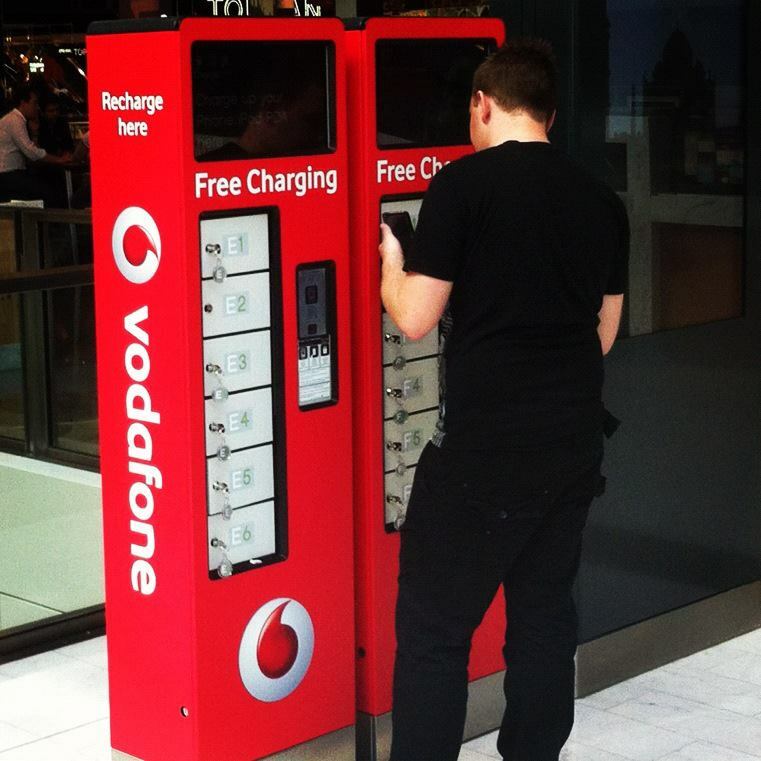 Shopping Center Westfield London offers Wi-Fi… and (almost) free mobile phone charging! London looks like the center of the universe, these days, thanks to London 2012 Olympic Games. Here comes a tiny news bit that shows how much technology can help/extend shopping experience. Obviously, by providing some basic information you get free Wi-Fi connection across within the shopping center: this seems very normal as of 2012. I came across a photo on their Facebook page, though, that shows a Vodafone-branded mobile phone charger. That’s cool: if you give customers the ability to tweet, post on Facebook and Pinterest zillions of products in such a huge store for a long time (do girls get out of a shopping center in less than 5 hours 😉 ), they’re supposed to drain their mobile toys’ batteries. No more details: from the Facebook comments it’s unclear if the service it’s free or requires £1.50 (as one user states); moreover looks like your cellphone gets locked, you get a locker key and no more than 30 minutes charging (maybe, later, the £1.50 gets refunded). Anyway, It looks at a really premium service to customers: sometimes you just need a little energy to keep your iPhone alive and tweeting. I guess there’s a nifty business idea behind this: wireless connection is so widespread, why shouldn’t device charging? Is there something similar for all the tourists and Olympics Games fans that are seizing London this days? This entry was posted in Business, Business Model, Case Study, Cell phone, Digital life, Energy, Energy efficiency, Family, iPad, iPhone, Marketing, Media, Mobile marketing, Mobile phone, Shopping, Social initiatives, Social marketing, Social Media, Tech industry, Technology, Twitter, Twitter hashtag, User experience and tagged Cell phone, Customer service, London, London 2012, London Olympic Games, mobile phone, Phone charging, Vodafone, Westfield London. Bookmark the permalink. A secret text adventure game is hidden into Google Chrome – and it’s compelling! Movies set in the (near) future: has the future in film delivered? MacSwitching.com The resource to people switching to the Mac (and to MacLife altogether): Mac OS X integration, Mac-Windows interoperability, iPod and most Macintosh-related topics! Jobely.com – Job opportunities around the world Search for job, hiring & consulting postings by keyword and/or country! Thousands added every day! ShareAfter.com – Your social status shared when you want it! ShareAfter is a Facebook Application that allows every Facebook © user to schedule (i.e. : postpone) status sharing. TheClickBiz.com – About Clicking & Business. Because every click means (or may mean) business! Nexus 7: Google’s 7″ tablet, available now from $199 | Stefano Paganini: mining for web, marketing, technology, fun on Google’s ChromeBook: the (very) next big thing? get-free-ipad on A new Flipboard-alike from Google?